Quick overview In 1825, an enterprising Canterbury newsagent by the name of Henry Ward raised a subscription to commission a lasting tribute to his beloved musical society. In 1825, an enterprising Canterbury newsagent by the name of Henry Ward raised a subscription to commission a lasting tribute to his beloved musical society. The result was a fine lithograph showing 100 gentlemen in assured poses, carefully placed in surroundings eloquently freighted with classical allusion, cultural literacy, deep-rooted patriotism, and strictly masculine politics. 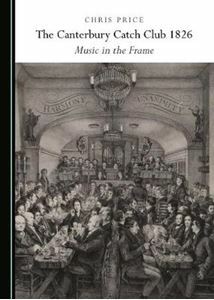 That image is the subject of this book.With insights gleaned from a unique collection of music, papers, and artefacts in the archives of the city and the cathedral, this study considers not only the accomplished performance of bourgeois status which is clearly visible in the print, but other characteristics of the Club which are either less pictorially privileged or entirely omitted. Deploying iconographical, cultural, and musicological analysis, the book discusses this curiously contradictory slice of British social history in which the respectable apparently coexisted happily with the libertine. What emerges is an unusually clear view of the production, performance and consumption of music in a provincial city at a fascinating time: a period when cultural activity was a strategic assertion of socio-political identity.